She learned to become an Egyptian woman and to live successfully in a culture so different from hers. She also had to learn to survive in a country in turmoil. One week after her arrival, the second revolution for independence in Egypt began, and she was living three blocks away from Tahrir Square, the center of the often violent protests and conflicts between between the civilians and the military police/army. 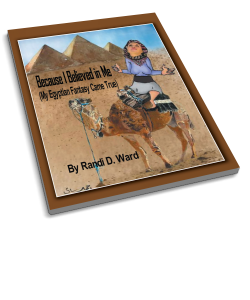 What she learned, experienced, and enjoyed in the Land of the Pharaohs is captured in her own words and emotions. She shares her many exciting adventures, her interesting but sometimes difficult daily life, her incredible teaching experience, and her students and her many friendships formed there plus her new and profound insights and understanding of Islam-once an extremely unfamiliar faith to her-and its true meaning.